Purveyors of the finest in Gentleman’s toiletries and accessories, The Piccadilly Shaving Company has brought together over 25 years of combined expertise in Luxury Men’s Grooming to offer an assortment of products which capture the tradition, quality, prestige and heritage of Brands in and around St James and Mayfair. Operating from London's most exclusive district, in offices situated at the former chambers of Piccadilly’s Carlyle Gentlemen’s Club, as well as supplying an exclusive assortment of luxury brands, The Piccadilly Shaving Company are proud to offer its own exclusive range of high-quality toiletries and accessories which are developed and tested in-house in Piccadilly, London. 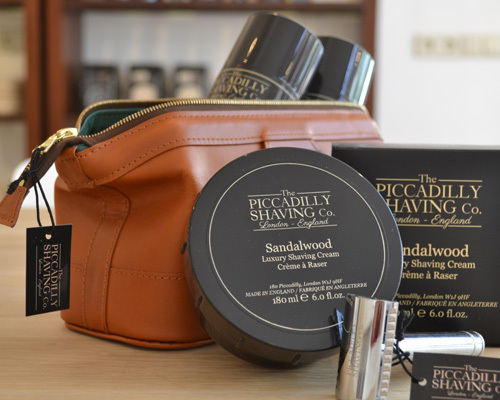 The Piccadilly Shaving Company is an independent, passionate, and essentially English Luxury Shaving Brand with a growing range of shaving accessories and toiletries all made in England to the very highest quality. We also offer a range of the finest quality shaving paraphernalia from other brands from the UK and Europe which we believe share our high standards.